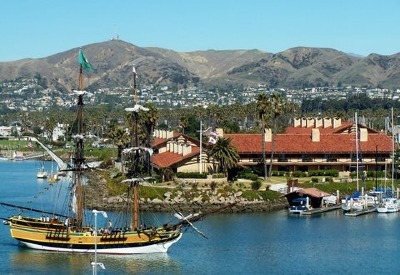 At Harbortown Point Marina Resort Ventura California, we offer condo vacation rental weeks. Their largest unit at 954 square feet, the Voyager, boasts a partial kitchen (no oven), large patio/terrace, 2 bathrooms, and sleeps 6 people in 2 queen beds and a queen sofabed. The elegant and spacious 630 square foot studio Mariner Floor Plan condo vacation rental includes a queen bed in the bedroom area, queen sofabed in the living area, full bath, and partial kitchen. Harbortown Point Marina Resort is located at the picturesque Ventura Marina, nestled against the California coast with sunny weather and warm temperatures. The resort is just 30 miles south of Santa Barbara and one hour north of Los Angeles. Surrounded by mountains, oceans, and calm harbor waters, the resort has the best of all worlds to delight all ages. Amenities include an outdoor heated pool, glass-enclosed spa, snack bar, complimentary movies, bikes, and a boat dock. Guests enjoy golf facilities, two public beaches, shops, and restaurants only one mile away. Please click here to see current availability, prices, payment options, photos and other information regarding Harbortown Point Marina Resort condo vacation rentals.